Help your customers succeed with your products and they'll be back for more. You know more about your product than anyone. and watch your sales grow. 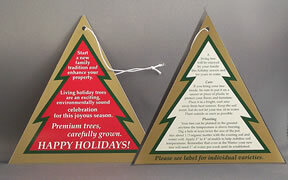 Designed for the Living Christmas Tree program that C, K and R Nursery does with Home Depot, these die-cut tags with a rich gold boarder (thank you, HIP, your special gold ink made these tags special) give complete information for the customer to use the trees indoors for the holiday and then plant outside. 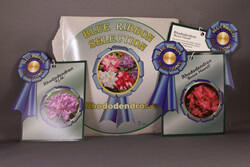 The Rhododendron tags for the 'Blue Ribbon' line from Corn Creek Farms consisted of individual, die-cut tags (thank you, Specialty Tag & Label) for each variety and a single label (6" pressure sensitive, produced by John Henry) that was applied on 1G, 3G and 7G pots for all the varieties. 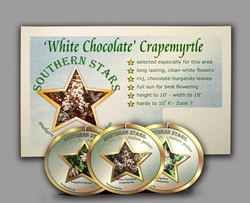 The 'Southern Stars' line, also for Corn Creek, featured individual die-cut tags (4") and signs (5"x7") for each species and variety, with full information on the reverse of each tag. P.S. Ask me about matching signs and banners for your customers. Signs and banners sell your products.